you'll notice her eyes first. rose quartz, they are colder than you initially realized. she stares with a boldness that makes you uncomfortable, makes you want to look away. unafraid, you think. her expression speaks her mind, does not hide it. you reckon she is probably bad at lying, the way her cold eyes translates her every thought. when you can no longer hold the directness of her brazen gaze, you notice the scars. they seem more important than the frivolous shade of rose hair mingled with flaxen silver. she is not the girl you initially took her for; a delicate silver flower, a dappled petal drifting along the water to be carried whither it will go. no, you think, she is the current; she walks with confidence that can't be faked. her posture suggests that she is in charge, not the other way around. the scars say she can prove it, and she will if she has to. she's not afraid. her hair is shorn short and blunt at the shoulder, her tail also cropped short. crude and practical. the stripes that bar her legs and neck aren't beautiful, they are feral and wild. she seems less and less what you might have thought. she’s everything a lady shouldn’t be. the priestesses woe the day the little she-monster showed up on the doorsteps of their secluded temple in the mountains. she’s a far cry from the blushing bride they’d hoped she would be. she’s wild and unruly. instead of elegant poetry on her lips, she utters curses saltier and dirtier than pond water. curse words seem to help get the point across, you see. she’s reckless, often breaking people and things before she really realizes what she’s done—she’ll never learn to think about the consequences of her actions. much to the priestesses’ dismay, she is far too blunt to navigate delicate socialite conversations, but you can always count on her honesty. you never know what you're about to get: the storm, or the profound silence after. she is unpredictable and unyielding in her pursuits, fearless in her desires and selfish in her motives to get there, damn those who get in her way. despite the many words of wisdom you could probably share with her, she'll self-destruct and then try the same thing over again, expecting different results. at this point in her life she lacks commitment to any one person or role, often petty and childish, discarding one quest for another, trading one friendship in for someone more interesting. don't take it personally, she'll grow out of it, eventually. she'll learn what is important in life, and then she'll be the fiercest companion you could have ever asked for. she laughs at herself, because who can take life too seriously? she laughs at other too, probably because they do take themselves a bit too seriously. she looks out for herself, because who else will? she survives because it’s what she’s always done. she is not much for love, it comes and goes. she’ll always be the storm, moving from valley to valley, announcing her thunderous presence in a drenching down pour, and moments later the grass will dry and there will be no sign of her chaotic passing. you’ll always wonder if she was real or just a mirage from the heat. she’s not overly complicated but she is a contradiction. she was born in the rift, a chaotic, monster infested realm with vicious, wild gods. there was nothing special about the birth, it was quiet and went well, aided by priestesses in a cold mountain temple overgrown with vines. perhaps the only remarkable thing about the birth was that her mother, a vain sorceress, wished, perhaps, that it had never happened. her father, a monster hunter of great renown, didn’t know she existed, and if he did, well, he pretended not to know. shortly after the birth, pavetta’s mother set off to continue her mysterious and extravagant lifestyle as a magic wielding sorceress, leaving the filly behind to an uncertain fate. 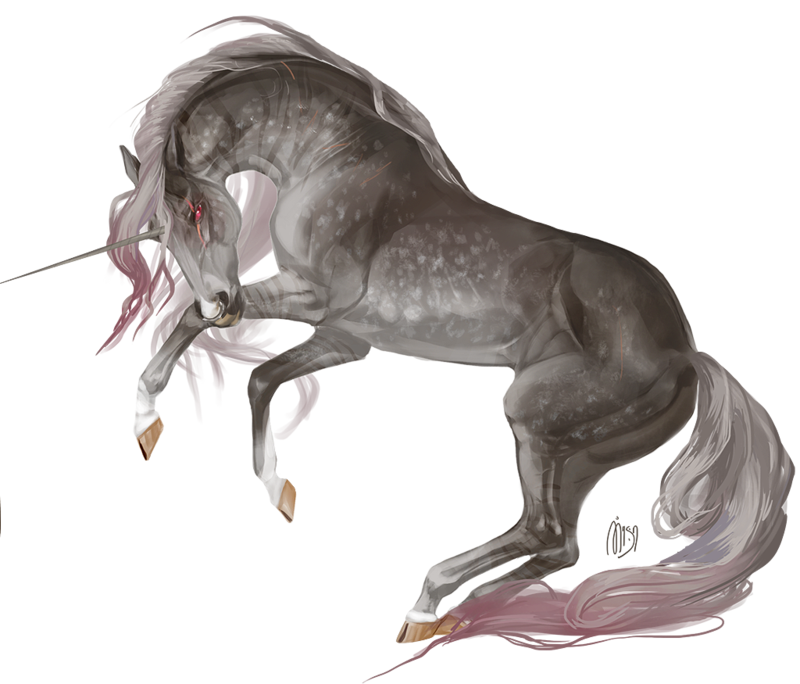 the sorceresses had high hopes for the silver filly—both the mother and father possessed innate magical abilities—surely the daughter would, too. she would be raised as one of their own, and one day, would either take her place among their prestigious ranks and use her powers for their benefit, or if the little filly grew up comely and not magical, she could make an advantageous marriage into one of the valley clans. thus her education to become a valuable asset of the Order began. she was groomed head to hoof every day, not a hair out of place, a fair image hiding the chaotic turmoil brewing within. her education consisted of sensible skills—poison, manipulation, seduction, botany, knowledge of arcane arts, diplomacy, and magical application. despite the Order's high hopes of pavetta joining their ranks, no magical abilities developed and she seemed more interested in tramping through the forest and sparring with trees than learning to navigate social situations and manipulating peoples' weaknesses. there were other initiates, but none of pavetta's age. she spent much of her time talking to toads and badgers and small birds, because what else is a lonely child to do? it did not take pavetta long to realize she was not like the women of the order. she did not care for the same things the sorceresses did--the flawless visage, the perfectionism, fighting tooth and claw to be the best, the lies, the manipulation, the dark arts, the endless pursuit for power. pavetta only wished to become a monster hunter, like the tales she had heard of her father's hunting prowess. she wanted to venture beyond the temple walls and to perhaps find a sparring partner that was not a tree or a mildly amused toad. she grew wild and more restless with every passing day. a thirst for knowledge of life outside the temple threatened to consume her. she dreamed of leaving, of finding her father and joining him on his adventures, for she had heard great tales of him. her father never returned for her. her dreams of running away had long since been forgotten. as a three year old it was clear to the sorceresses that her powers would never manifest and would probably remain dormant for the rest of her life. however, she had grown sleek and comely in her girlish youth and she was nearly a suitable age to become a bride. pavetta's education in the order continued (sorcery and magical application did not) and she became quite skilled in the way of plants and natural things. she learned to lie, to manipulate, to seduce, to both heal and poison, and yet she remained true to herself, wild and unruly, refusing to conform to the standards expected of her. twigs littered her hair, mud smeared her silver coat. exasperated and at their wits ends as what to do with their disappointing ward, the priestesses arranged a marriage to a clan warlord in the valley beyond. he was the leader of a warring clan, a powerful one. the initiation into the clan was brutal but marked her as a worthy bride. he was silent and cold, but not altogether unkind. he recognized the proud fire inside her, the glowing embers the priestesses had overlooked, and taught her the intricate art of battle (as well as the not-so-subtle ways between a man and a woman). she was an excellent fighting pupil, savage in her rabid onslaught, but truly a poor bride. she did not grow to love him (perhaps with more time she could have) but respected his prowess in battle and his fierce devotion to her well-being. after all, how could she really know what love was? she felt destined for other things; she wished to be away in a life of adventure and exploration, not one of servitude and silence. surely there was more to life than waiting for her husband to come home from battle and warming his bed? she did not weep the day he did not return from battle, but mourned the loss of her sparring partner. the clan women sheared her hair short and blunt as grieving custom demanded, but the silver-rose hair falling to the ground felt more like freedom than anything she had ever felt before. she watched her husband's pyre burn and then disappeared into the night. hello! i like video games and my cat pumpkin.